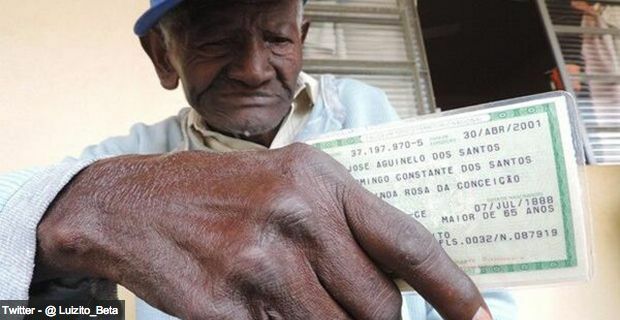 Brazilian Jose Aguinelo dos Santos could be the oldest living person ever to be recorded on the planet. He recently received an official birth certificate from the state based on a testimony he gave to a judge back in 2001. The date of birth on the certificate reads 07/07/1888 which would mean that he is 126 years old. Jose is the son of two slaves and if his date of birth is accurate, he would have entered into the world when slavery was still legal and common in Brazil. He made his living working on a coffee farm and in 1973, when he was 85 years of age, he began living in an old person's home in the state of Sao Paolo. A worker at the home, where he still resides, said of Jose "He doesn't have high cholesterol, diabetes or high blood pressure. The only medicine he takes are vitamins and a tablet to give him an appetite, which you can lose with old age." dos Santos puts his age down to living a lot saying "The truth is that you just keep getting older. You take each stage at a time. If I got to this age it’s because I’ve lived a lot, that’s all." Currently, the Guinness Book of World Records lists one Jiroemon Kimura from Japan as the oldest person to have ever been recorded. Kimura was a whopping 116 years and 54 days old when he died in 2013 so if dos Santos is actually as old as he says then he will beat Kimura's record by a full decade. He is physically in great shape being able to move around completely unassisted. dos Santos is also remarkable as he smokes a pack of cigarettes every day and has done so for the past 50 years. The home where he resides is determined to prove his age and are looking to raise funds to have him undergo Carbon-14 testing.